The most recent military draft in Ukraine has been described as “problematic” by Kiev's army spokesman. The recruitment effort, coming amid ever more intense fighting in the country’s east, sees a lack of enthusiasm on the part of potential soldiers. The comment comes as Ukraine’s Joint Staff reported of the first stage of the draft – sending out conscription notices – being over. The military warn of blacklisting deserters and passing on the information to police. A little less than 7,500 Ukrainians are already facing criminal charges for evading military service, the country’s Defence Ministry announced on Saturday. The Ukrainian president’s adviser, Yury Biryukov, was more specific earlier this week. He did cite preliminary draft statistics, showing evasion was primarily a problem in western Ukraine, traditionally a major source of anti-Russian sentiment. According to Biryukov’s figures, 57 percent of Ivano-Frankovsk potential conscripts would not show up at enlistment offices, while 37 percent fled Ukraine. He mentioned that local authorities in the Ternopol region were sabotaging the draft, refusing to help distribute notices. 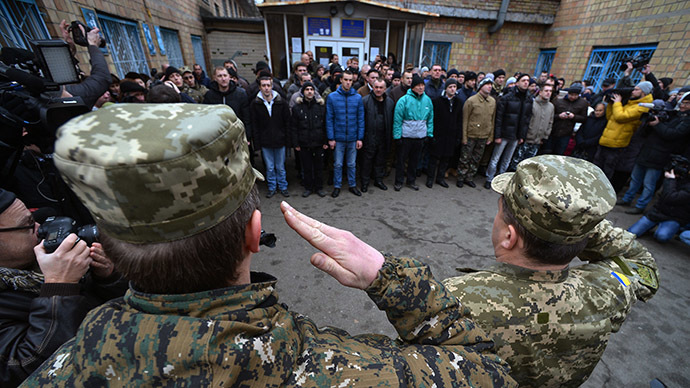 Nineteen percent of Volynskaya region men, bound to military service, cited religious motives for not joining the army. Previously not more than 0.7 percent would use this pretext. Mass reluctance to serve has not gone unnoticed by international monitors. Members of OSCE mission in Ukraine spoke to a city official and a volunteer battalion commander in Krivoy Rog, both sharing fears over draft evasion. “According to the plan, about 800 individuals are supposed to be mobilized within a week. However, a considerable number of people are trying to avoid mobilization by various means, the interlocutors said,” the January 27 OSCE report reads. “[The draft dodger] is a cowardly animal,” Biryukov’s angry Facebook post, deleted by now, concluded. “With his tail between his legs, he hides from the mobilisation, changes his phone number, he gathers his stuff and runs off to Hungary, Romania, Slovakia or Poland. And he sits there, happy that he is so clever”. Ukraine’s president signed a decree on Friday on additional measures to ensure successful draft in 2015. A major provision is temporary restriction on leaving the country for men, bound to military service. Neither appeals to patriotism, nor threats, nor insults made Aleksey, a young man from Mariupol want to find himself on the battlefield. He’s one of those who chose to flee to Russia. Russia welcomes Ukrainian mobilization evaders, President Vladimir Putin said earlier this week, promising to legalize longer stays in Russia for bound-to-service Ukrainians. This one is the fourth wave of mobilization since Kiev launched a military operation against anti-government forces in eastern Ukraine. Each was accompanied by massive protests from the draftees’ relatives. Kiev resumed its military operation in the east of Ukraine in January, following months of relative respite. Reports of residential areas coming under fire have since come almost daily, with human rights organizations calling on both sides of the conflict to protect civilians. Some 8,000 Ukrainian troops are currently believed to be surrounded near the village of Debaltsevo in Donbass, as militia units cut off the only road linking the pocket to Kiev-held territory.